Boreal breathes climbing just like they inhale the crisp mountain air that they love so much. As the creators of the original sticky rubber climbing shoes, Boreal has continually showcased their passion for the outdoors with every piece of product they produce to help you chase down your own adventures. As the manufacturer of high quality climbing shoes, this brand refuses to back down from the challenge of perfecting the art of rock scaling. Boreal works tirelessly to unleash the finest foot huggers for attacking the most intimidating climbs by continuously innovating and unfolding new technologies. Founded in 1975, Boreal has never failed to focus their efforts on what they love most. Now, based in Villena, Spain, they are supremely situated to continue their pursuit for producing the footwear that makes rock climbing a love of everyone who has ever thrown fear to the wind and lunged for that last hold with reckless abandon. Defining the pinnacle of climbing shoes is the Boreal Kintaro Rock Shoe. An aggressive downturn lets you stick your foot precisely where it needs to be for a technically efficient climb. Outlandishly sticky, as well as abrasion resistant, the rubber soles, made from Boreal Zenith, perform at their peak while never sacrificing an ounce of performance in a plethora of environments. The V2 Rand system grasps your heel firmly, yet comfortably so that it can become just as useful of a climbing tool as your toe. 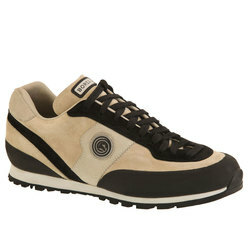 A split leather upper and a pair of Velcro fasteners lock you into a pristine fit that will propel you up any pitch. Precision and fit highlight the Boreal Blade Climbing Shoe. With a toe that harnesses a slight down curve, this shoe is tailored to climb a variety of terrain. Asymmetrical design and buff rigidity offer seemingly limitless support on footholds of all kinds. Rubber reinforcement and a mid stiff midsole that employs an anatomic cutaway ensure your feet stay protected and comfortable from bottom to top and back down again. The low profile toe is perfect for thin edges and small pockets, so whether you are zipping around a boulder field, or tackling a gnarly crag, you are sure to get insane performance out of the Blade. Boreal fashions some of the most elite women’s climbing shoes as well, which are specifically crafted to conform to those feminine feet. Everything you want in a slice of footwear for any climb, the Joker Plus Velcro Shoes combine all the necessary facets that are required for success. Made to keep you comfortable during all day climbing sessions, this pair rocks an ergonomic padded heel that will have you choosing them over your bunny slippers even when lounging at home. Ridiculously simple to get into and fasten, you can latch them down for a glorious custom fit every time. Comfortable, functional, and unstoppable, the Women’s Joker Plus Velcro Shoes are everything you could wish for on your feet while dangling from a rock face. 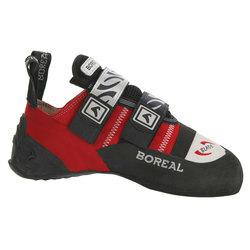 Boreal’s unparalleled collection of climbing shoes is just what those who live life on the edge crave.